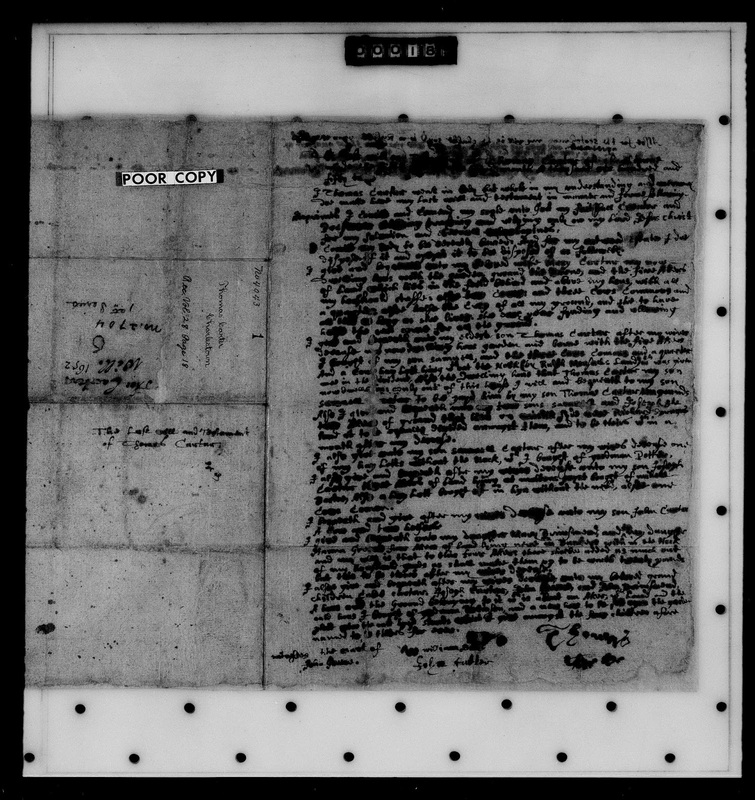 Genea-Musings: Dear Randy: Where Can I Find the Will of Thomas Carter (1585-1652)? Dear Randy: Where Can I Find the Will of Thomas Carter (1585-1652)? I received this query from reader Martha recently: "I have recently run across your Amanuensis Monday - Will of Thomas Carter (1566-1652). I believe he was my 10x great-grandfather and am trying to sort out the details. Can you tell me where to find a copy of his will that I can use as documentation?" 1) I obtained the probate records of Thomas Carter (1585-1652) of Charlestown, Massachusetts many years ago from FHL US/CAN microfilm 0,386,051, having ordered the microfilm from Salt Lake City at my local Family History Center back in the early 2000s. I made a photocopy of the pages at the Family History Center from the microfilm. 2) This record is now in the FamilySearch Library Catalog in digital format in probate packet 4,043, starting at https://www.familysearch.org/ark:/61903/3:1:3QSQ-G9DL-X9ZW-L?i=184&cat=263304 . The will is very dark, and is difficult to read. They are all the same images. 5) You should be able to find the probate court clerk books for Middlesex County, Massachusetts on FamilySearch and get the probate court clerk's transcription. The Will is in these volumes in Volume 28, page 18 and the inventory on page 20. 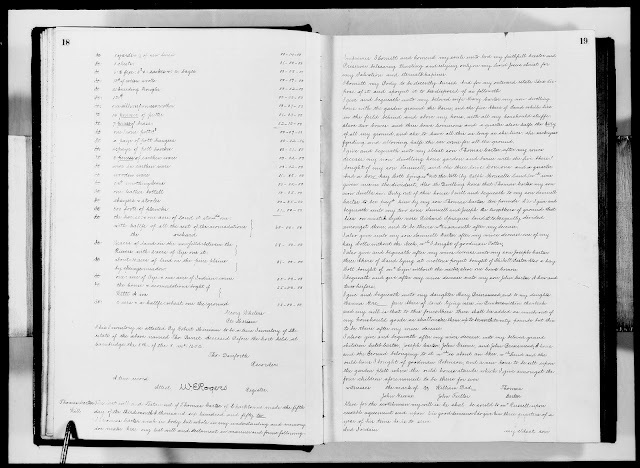 The will starts at https://www.familysearch.org/ark:/61903/3:1:3QS7-99D5-BJDH?i=280&cat=263304 This is really easy to read, but we don't know if the clerk was able to transcribe the original accurately. This may have been what I used for my transcription - frankly, I don't recall. You could use the probate court clerk transcription to compare to the original will to ascertain the accuracy of it. 6) In just the last five years, we have gone from having to obtain a microfilm to find this record, copy the pages we want and hope that they are readable, to having a digital copy of these probate records online in at least three different digital repositories, one of which is free to access at home. We still have to hope that they are readable! 7) If you are not finding and using these documents on digital microfilm, then you are missing out on easily finding original sources that provide primary information and direct evidence of events and relationships of our ancestral families. It is not difficult to learn how to do this, but it does take some practice. There are FamilySearch and Family Tree Webinars available to demonstrate the search and access process. I, and others, have been giving presentations on using digital microfilm to find vital, church, land, probate and other record types for several years now.